Hervé’s second attempt, after Les Chevaliers de la table ronde (1866), to produce a full-length burlesque opérette to challenge the all-consuming works of Offenbach, L’Oeil crevé did precisely that, proving itself one of the most successful opéras-bouffes of the greatest era of burlesque entertainments. A caricature of composer Hervé. Fleur de Noblesse (Julia Baron) is, in accordance with her name, a flower of a noble family, the daughter of the local Marquis (Berret) and Marquise de Haut-en-Truffes (Adèle Cuinet). However, she has been attacked by a grotesque passion for carpentry and, not coincidentally, for the young cabinet-maker Ernest. The hand of this noble maiden is put up as the prize in an archery contest which is the highlight of the piece, so she uses her woodworking talents to ‘fix’ the targets. Thus Ernest seems to hit the bullseye, but his triumph and his prize are postponed when the Robin-Hoodish forester Alexandrivoire (Marcel), the beloved of the peasant girl Dindonette (Mlle Berthal), arrives on the scene with a challenge. However, Fleur de Noblesse gives the target a shove at the critical moment and, far from splitting his rival’s shaft, or marking his announced bullseye, Alexandrivoire instead puts his arrow in the eye of the noble maiden. The one gendarme, Geromé (Milher) who constitutes the whole of the Marquisal army arrests the miscreant and plunges him into a dungeon tower. But Dindonette organises the extraction of the arrow and, an actful of disguises, doctors, duets and long-lost-babytalk later, everything can end happily. 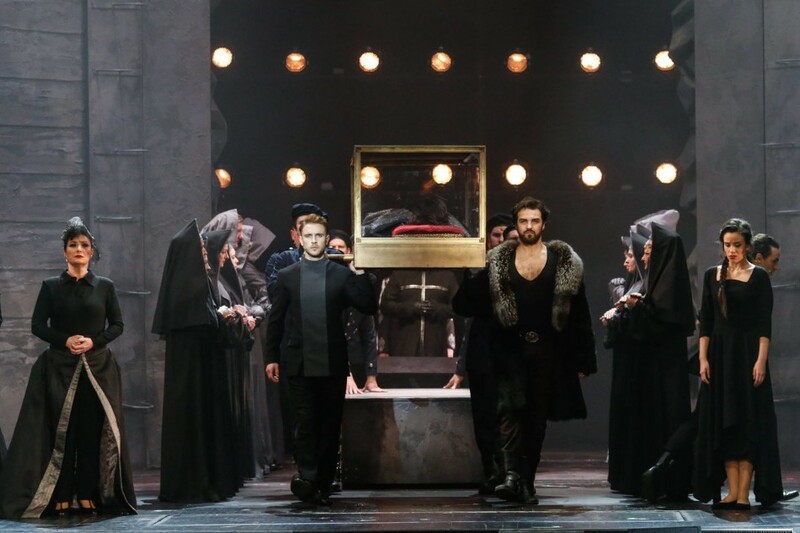 The tale gave the opportunities for a whole series of particular burlesques from the Robin Hood, William Tell and Lucia di Lammermoor moments of the archery contest, to musical mockeries of Der Freischütz (a hunters’ chorus) and Il trovatore (a miserere duo for Dindonette and her imprisoned swain), but the favourite portions of Hervé`s brightly comical score were a duo for the Marquis and Dindonette — the Légende de la langouste atmospherique, an auvergant dialect tale about a chap who used the magic herb of brotherly love to spice his cooked lobster instead of spreading it around the world, Alexandrivoire’s La Polonaise et l’hirondelle (`Un jour passant par Meudon’), his third-act tyrolienne (`Tournes, tournes, petits batons’), Geromé’s comical military number equipped with drum imitations, and the septet, chorus and finale of the second act which culminated in a crazy, concerted massed effect much like the more famous first-act closing of the author’s subsequent Chilpéric with its umbrellas and horses. “L’Oeil crevé” was an enormous hit. 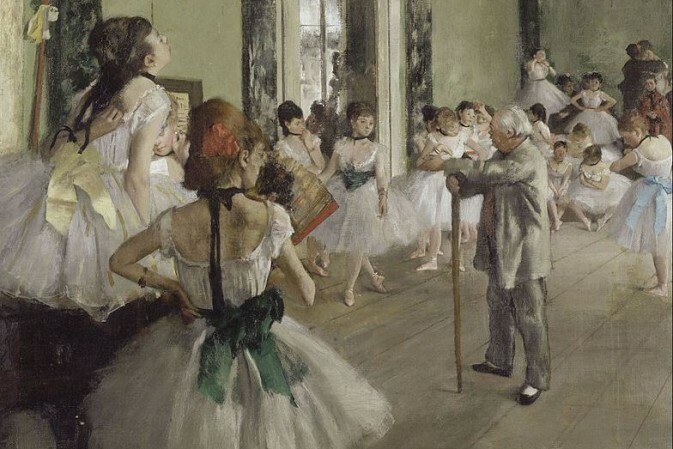 It ran a remarkable 345 performances in its first year, and it returned regularly to the Parisian stage thereafter. It was seen again at the Folies-Dramatiques in 1872 (May) and again in 1876, with Mme Prelly (Dindonette), Simon-Max (Alexandrivoire), Noémie Vernon (Fleur de Noblesse) and Milher in his original rôle, revised by Hector Crémieux for a royally-cast production at the Théâtre de la Renaissance in 1881 (24 September ‘an entirely new libretto’) which interpolated a new rôle for star soubrette Mily-Meyer, mounted at the Théâtre des Menus-Plaisirs in 1889, 1890 and 1892, and at the Variétés in 1896 (18 April) where Albert Brasseur (Duc d’Enface), Germaine Gallois (Fleur de Noblesse), Juliette Méaly (Dindonette), Ève Lavallière (Ernest), Paul Fugère, Jane Pernyn (Alexandrivoire), Guy (Marquis), Baron (Bailli) and Milher, again, headed the starry cast. 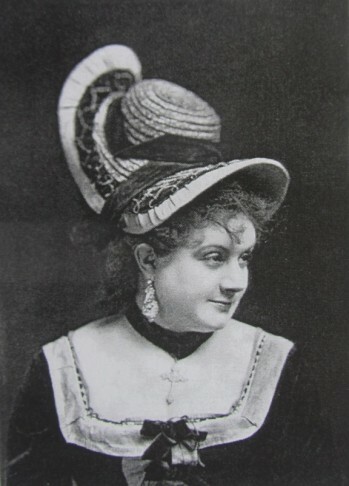 It came back to the Variétés again in 1904 (30 December), well after the vogue for genuine opéra-bouffe had faded, with Anna Tariol-Baugé playing Dindonette alongside Brasseur and Mlle Pernyn, now promoted to Fleur de Noblesse. In 1999, in a France just beginning to once again show interest it the great works of its burlesque-theatrical past, a fiddled-with version of the piece was staged at the Opéra-Comique (21 December) under the aegis of Péniche Opéra and the title Vlan! dans l’oeil (which, it was insisted, it was Hervé’s original intention to call the piece), bringing something approximating L’Oeil crevé back to the Paris stage after almost a century of absence. L’Oeil crevé was a burlesque piece in Hervé’s furthest-out style, and if the Paris of 1867 found that style hilarious, it was by no means sure that other centres would – presuming that an adapter could be found who would and could repeat the flavour of the original in another language. Vienna gave Das Pfeil im Auge (ad Julius Hopp) just four hearings, and an equally uncomprehending New York, which got the piece in its original French from Maurice Grau’s company with Rose Bell (Dindonette), Marie Desclauzas (Fleur de Noblesse), Carrier (Alexandrivoire), Beckers (Marquis) and Gabel (Geromé) featured, also gave it the thumbs down with sufficient firmness to ensure that the show was never produced in New York (or, as far as I can see, anywhere else in America) in English. England, however, which was to repeatedly prove the most receptive among ‘foreign’ countries to Hervé’s extravagant comicalities, was pleased enough with its first glimpse of his work when F C Burnand’s rather approximate adaptation of L’Oeil crevé was produced at the Olympic Theatre as Hit or Miss, or All My Eye and Betty Martin in 1868 (`the music puts to shame the music-hall stuff accepted in burlesque’). Emily Pitt played Peter (ie Alexandrivoire), Louisa Moore was Lady Betty Martin (Fleur de Nobelsse), Lennox Grey was the equivalent of Dindonette and Robert Soutar and J G Taylor were the Marquis and Marchioness. John Clarke made a feature of the Marquis d’enface, neatly Burnandised as ‘the Duke of Totherside’. After the huge subsequent success of Chilpéric in London, the city was happy to see the older show again. It got it both in French (‘as played in Paris for 345 nights’), from the visiting Folies-Dramatiques Company (who also did Chilpéric and Le Canard à trois becs but won greatest applause for this piece), featuring Paola Marié (Dindonette), Blanche d’Antigny (Fleur de Noblesse) and Vauthier (Marquis), and then in a new H B Farnie version at the Opera Comique (L’Oeil crevé or the Merry Toxophilites, 21 October 1872) produced under the management of E P Hingston. Julia Mathews (Fleur de Noblesse), Mlle Clary (Alexandrivoire), Pattie Laverne (Dindonette), Richard Temple (Geromé) and David Fisher (Marquis) headed the cast in which Richard Barker, the director, appeared as ‘the Sentry’, and the piece scored a fine success running through November and December and into the New Year. 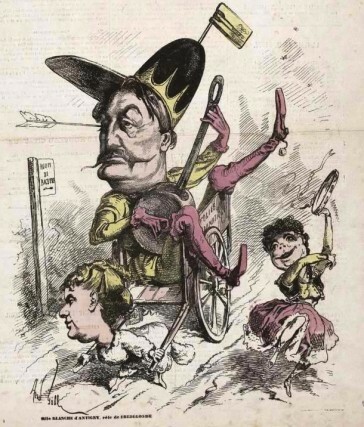 Yet another version of the piece – the fourth in a decade – returned to the West End in 1877 when a five-scene reduction of Farnie’s text was added to Alexander Henderson’s triple bill (La Créole, Up the River) at the Folly Theatre (as Shooting Stars, 22 November) with Kate Munroe (Dindonette), Lizzie Beaumont (Fleur de Noblesse), Violet Cameron (Alexandrivoire), John Howson (Gerome) and C H Drew (Marquis) featured.Australia got the Farnie version.